Hockey is back in full swing this semester. This years competition in the region has been tough. With two Division I teams moving down to Division II there is an exciting amount of new competition and skill within the region. Kansas State has managed to stay middle of the pack up until now. We are hoping that the new home rink at the Rec will be a turning point as we come toward the end of the regular season. 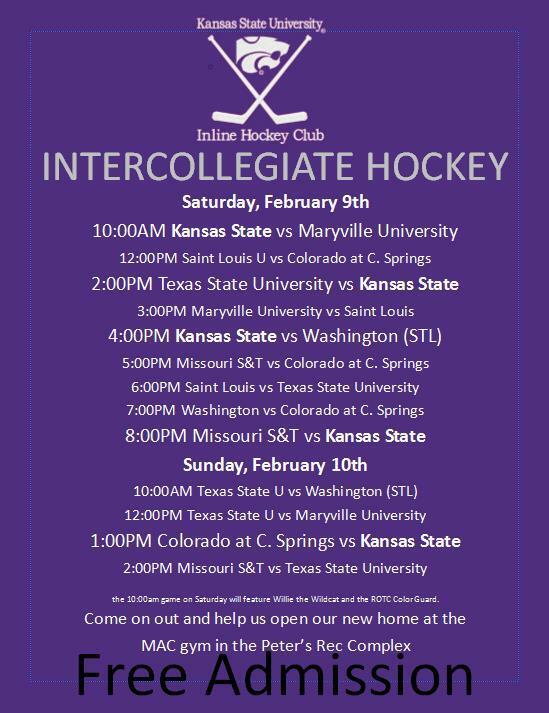 You can help in our effort by coming out to support our team for our home opener in February. See our flyer for more details. After a hard fought national playoff series, Kansas State finished in the final four, losing 6-2 to a tough Central Michigan team in the semi finals. Central Michigan went on to defeat Pittsburg 8-0 in the finals to win the national championship. 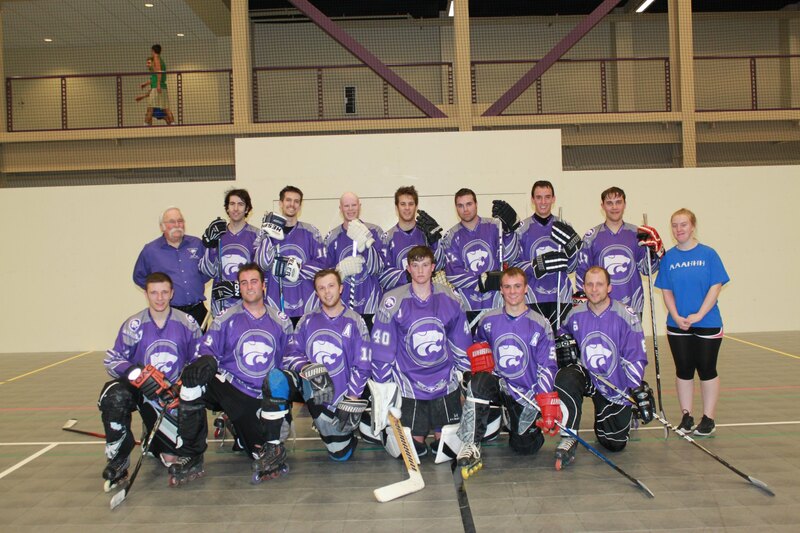 This final four finish ties the best finish in Kansas State Inline Hockey Club history. We are looking forward to having another great year next season! Finished the regular season in a strong second place. We've tied the first place team, Maryville, twice and are looking for another good game this weekend at regionals in St. Louis! Please come out and support the team if you can, this is the best team we've ever had with the best chance of bringing home that regional cup! Also, pick up a copy of the collegian tomorrow morning. There should be an article on the team! Finished the semester tied for second in the region. Looking for a strong second semester after the break! Hockey club is doing a fundraiser in KC this weekend. We're picking up trash after the Friday, Saturday and Sunday race events at the Kansas Speedway. Exhibition game vs. Northwest Missouri State in KC at 2:00pm on Sunday at Brookside Roller Rink in Holmes Park (70th and Holmes). Playoffs at 1,2 & 3PM on Sunday. Exhibition game against NW Missouri State in KC on 10/9/11 at 2:00pm. Bus leaves Sunday at 11am from Z18. Fund raiser in KC 10/7-10/9 picking up trash at the KC speedway. St. Louis travel dates for this semester have been released. Headed to Denver on Sept 30th for four games on Oct 1st. First Practice tonight at Spin City in Junction City. Check out the 'practice' link on the left for more information. New season is about to start! Please come visit us at the Activity Carnival, the first meeting, or the first practice if you're interested in joining the club. Also feel free to send any of the officers an e-mail in the 'contact' link if you want to learn more! Here's a list of some activites to kick the year off. Any and all are welcome. Thursday 8/25/11 6-8PM - Activity Carnival in the Student Union. We will also have a net setup for students to shoot pucks into. Friday, Sept 16 - Fund Raiser! We will be providing valet parking for the Beach Museum. The Alumni Game has been scheduled for April 2nd at 10:00am at Spin City in Junction City! Invite your family invite your friends, invite your next door neighbor! It's ging to be a blasty-blast! Come see us at the 'Winter Classic' activities carnival tonight in the K-State Student Union! This is a great time to learn more about our club if you're interested in joining. If you can't make it tonight, don't be afraid to e-mail one of us in the 'contact' section! School of Mines and Colorado this weekend! Let's come home with two wins! First weekend back at school and we're on the road to Denver. Practice starts the first day of school; Tuesday (7:00 - 8:30) and Wednesday (7:00 - 8:00). Team is looking really strong this year, join the revolution! Got 4th in the Illini Invitational, good job team! This last weekend we went 3-0! Got a tough rest of the season, practice hard! Get ready for the Illini Invitational this weekend! We have a week of practice left to prepare, let's make it a good one! Must have Denver trip paid for to attend this trip. Practice has started and is open to anyone, e-mail me (Joel12@ksu.edu) if you want more info. The practice facility is in Spin City in Junction City, come on out and find out what we're about! First Meeting AND practice of the semester for all interested students and current members. Get ready for the new season! If you'd like to join the club you can get more info by coming to this first meeting and you can also contact me at Joel12@ksu.edu. Alumni Game this Saturday in Junction at Spin City, 10:00 AM. Picnic after the game at Milford Lake Army Corps or Engineers, shelter #1. BYOB, hamburgers and hot dogs provided, donations appreciated to help cover food costs. *used to have it listed as Beach museum, that was incorrect, it is at the Wareham. SIU-E @ 9:00am at Queeny park on Saturday. If we win, we will finish in 9th. If COP wins, we finish in 10th, if Ill St wins, we finish in 9th. Practice starts again this Tuesday (1/19) so be there!!! Lets win these so we can go to Cali for the Championships! First half of the season is over! Good work everyone, best season so far in a long while (5-4-2). Enjoy Thanksgiving and Winter break; next games aren't until January 30th. Don't forget to keep going to practice! Team is headed St. Louis the next two weekends in a row. November 7th & 8th, and the 14th & 15th. In other news, Chris Clavin has been placed on the injury list until further notice. Next Travel Weekend is October 24-25th in St. Louis. Don't forget to pay your dues and travel fees. Merch comes in soon, wear it around and let people know about the club! K-State Inline Hockey is the proud new owner of a retired 13 passenger K-State parking shuttle bus, head over to the sponsors section for pictures and some gratitude. Denver preseason tournament - 9/25-27/09. Bus leaves Friday, returns Sunday. Bring the heat. Meeting tonight at 5:30 in Waters 106, its on the east side of the building. This is open to everyone, who is in the club or looking to join! Don't forget about valet parking on friday night, more on this later. First Practice in Junction City at Spin City tomorrow night (Tuesday) from 7:00 - 8:30 pm Wednesday nights will be from 7:00 - 8:00 pm . Click the 'practice' link on the left for directions. Always feel free to send any of the people on the contact page an e-mail if you have questions or need a ride to practice. See you all there! First meeting is tomorrow night, Tuesday August 25th at 6:00 pm in the conference room in Waters Hall (room 137ish maybe? Just look for the big room with people in it on the first floor in the middle section). Doesn't matter if you are a returner, or want to join the team; please come! Don't forget first day of practice is next Tuesday, give us a shout (see 'contact' section) if you want a ride. Interested in joining the team? Check out the contacts section and send us an e-mail for more information. table and other 'exhibits' that evening. Please plan on being available. other side of the city). hotels etc later for that one. Congratulations to our new club president, Coleman Younger! More election results coming soon. The alumni game is scheduled for 10:00am on Sunday 3/29/09 at the Junction City rink. The doors will open by 9:00am. We will have a BBQ at Milford Lake State Park after the game. This is open to alumni, team, family and close friends. Van will leave the parking lot at 5:15am Saturday. 02/27/2009 : Van will leave at 6AM since first game will not be played. Van will be leaving 6:00am Saturday. Games at 1 &5pm Saturday & 8am Sunday. Van will be leaving 7:00am Saturday. Games at 7 &10pm Saturday & 8 & 10am Sunday. The van will leave from lot B-18 at 6:30am on Saturday 24th! First practices in 2009: Tuesday and Wednesday 20th and 21st of January!! Here's the schedule for the Texas week-end. We will be leaving Saturday morning. The league tournamen on February 7 will be played in Denton, TX instead of St. Louis. No practice on Thanksgiving week. We will resume practice on Tuesday 12/2/08. The van will leave from lot B-18 at 6:30am on Saturday 15th! We will leave at 4:00PM on Friday from parking lot B-18, off Jardine Drive. for our Valet Parking fundraiser at the Alumni Center. Meeting next Tuesday at 5:00PM in 137 Waters Hall to layout our plans for this season and to introduce the current and new members of the club. Team members and prospective members to meet in the quad in front of the Student Union at 5:45PM Thursday 8/28/08 for the activity fair. We will once again be doing a car bash fund raiser. We'll need people as well to man a table inside the Union for recruitment. Practice will start on Wednesday 9/3/08 in Junction City at 7:00pm. Practices will be on Tuesday & Wednesday nights from then on. After the Christmas break, we will go to a 2.5 hour practice on Tuesday nights only. Activity Carnival - 8/28/08 - We will need as many people as possible to man our recruitment table and perhaps another car bash. Denver pre-season tournament on October 4-5. 7 rooms are reserved in the Drury Inn in Denver for Saturday & Sunday night. There is no school on the following Monday! for our Valet Parking fundraiser. Denver preseason tournament either the week-end of 9/27-28 or 10/4-5. New pictures and stats have been uploaded. Alumni game was great succes. Special thanks for the alumni who not only traveled to help put on a great event, but also supplied the food for the BBQ afterwards. We meet again in late August for the start of our best season yet. Van leaves this Saturday 6:00am !!! for St. Louis. We will have a tow hitch this time. Annual alumni game held in Junction City, Saturday March 29, 2008 from 11am to 12:30pm. We are leaving at 7AM on Saturday for St.Louis.